– Martin Tomczyk also in the points. photo caption: BMW Motorsport, Marco Wittmann (DE) Ice-Watch BMW M4 DTM, Pit S.
The rain that started to fall as the lights went out to signal the start of the second round of the 2014 DTM made the race in Oschersleben (DE) a tyre lottery. After an eventful race, with no fewer than three safety car periods, Augusto Farfus (BR) came home fifth in the Castrol EDGE BMW M4 DTM, while Martin Tomczyk (DE) also picked up points, finishing ninth in the BMW M Performance Parts M4 DTM. Lady luck deserted the rest of the BMW drivers in difficult conditions: despite impressive displays for vast stretches of the race, they still missed out on a place in the top ten. The last of the three safety car periods brought the field back together and resulted in Tomczyk, António Félix da Costa (PT) and Bruno Spengler (CA) who were battling for places on the podium at the time losing valuable positions. 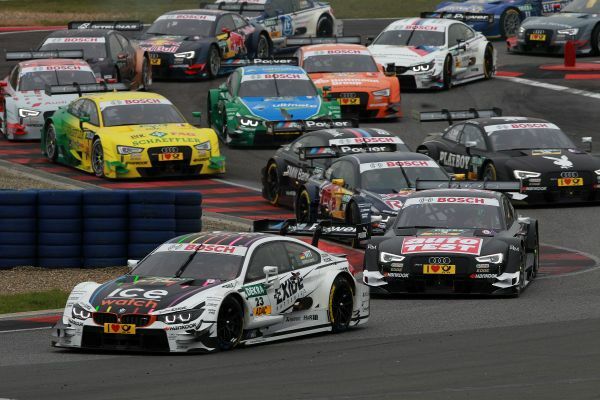 DTM rookie Félix da Costa finished 11th in the Red Bull BMW M4 DTM, missing out on the points by just 0.2 seconds. He was followed by Spengler in 12th in the BMW Bank M4 DTM. Maxime Martin (BE, SAMSUNG BMW M4 DTM) was 14th, while Joey Hand (US, Crowne Plaza Hotels BMW M4 DTM) came home 15th. Marco Wittmann (DE) was unable to convert the pole position, to which he was promoted after the post-qualifying disqualification of Audi driver Miguel Molina (ES), into any form of result. Form the start, Wittmann was able to defend first place in the Ice-Watch BMW M4 DTM and actually started to pull away from the rest of the field. However, he lost valuable ground at the restart after the first safety car period when he skidded into the gravel trap in turn one. He then dropped further down the field with a technical problem. After 44 laps, Wittmann eventually crossed the finish line in 19th. Timo Glock’s (DE) race was over after just a few laps. The German spun while battling with Mike Rockenfeller (DE) and beached the DEUTSCHE POST BMW M4 DTM in a gravel trap. “The weather conditions made that an unbelievably eventful and hectic race – certainly one of the most exciting in recent years. We are obviously not happy with the result. However, it does not reflect the performance of the BMW M4 DTM. When you start from pole, you obviously want to win. Standings after 2 of 10 races. Drivers’ standings. 1. Mike Rockenfeller (30 points), 2. Christian Vietoris (25), 3. Marco Wittmann (25), 4. Mattias Ekström (18), 5. Adrien Tambay (16), 6. Edoardo Mortara (15), 7. Augusto Farfus (14), 8. Paul di Resta (12), 9. Timo Glock (10), 10. Bruno Spengler (8), 11. Miguel Molina (8), 12. Timo Scheider (8), 13. Martin Tomczyk (8), 14. Gary Paffett (4), 15. Joey Hand (1). Team standings. 1. Audi Sport Team Phoenix (38 points), 2. Original-Teile Mercedes AMG (37), 3. Audi Sport Team Abt (31), 4. Audi Sport Team Abt Sportsline (26), 5. BMW Team RMG (25), 6. BMW Team Schnitzer (16), 7. BMW Team RBM (15), 8. BMW Team MTEK (10), 11. EURONICS / FREE MAN'S WORLD Mercedes AMG (4.). Manufacturers’ standings. 1. Audi (95 points), 2. BMW (66), Mercedes-Benz (41). 2014 calendar: 4th May – Hockenheim (DE), 18th May – Oschersleben (DE), 1st June – Budapest (HU), 29th June – Norisring (DE), 13th July – Moscow (RU), 3rd August – Spielberg (AT), 17th August – Nürburgring (DE), 14th September – Lausitzring (DE), 28th September – Guangzhou (CN), 19th October – Hockenheim (DE). Marco Wittmann erringt beim DTM-Saisonauftakt den ersten Triumph für den BMW M4 DTM. 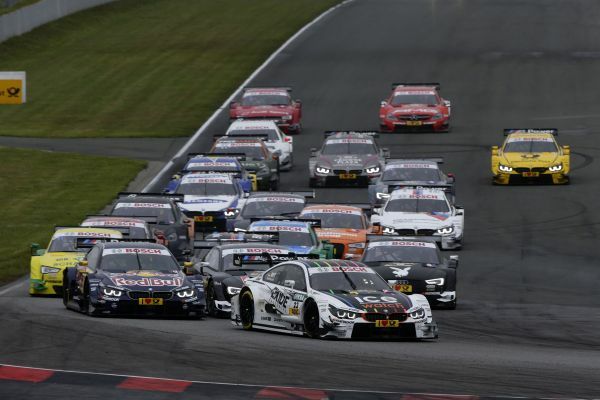 BMW Motorsport has made a successful start to the 2014 DTM season. The new BMW M4 Coupé DTM Safety Car leads the field in 2014. Spengler and Tomczyk give BMW rookies Félix da Costa and Martin a behind-the-scenes tour of the DTM. BMW Motorsport and ZF long-term partnership between enters the next round.